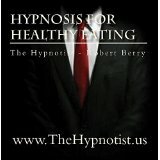 Let master hypnotist and stage personality Robert Berry help you transform the way you look at food. Creating healthier eating habits could not be easier. Through hypnosis, creative visual imagery and NLP your thought processes will be change and you will be eating healthier in no time.